The leaders have put together for the very first time, topics that were heavily requested by our communities. If this is successful, you can look forward to more of such ‘Technology Updates’ in the upcoming months. So, make a date with us! We hope to meet and get to know you on 27th June 2009. 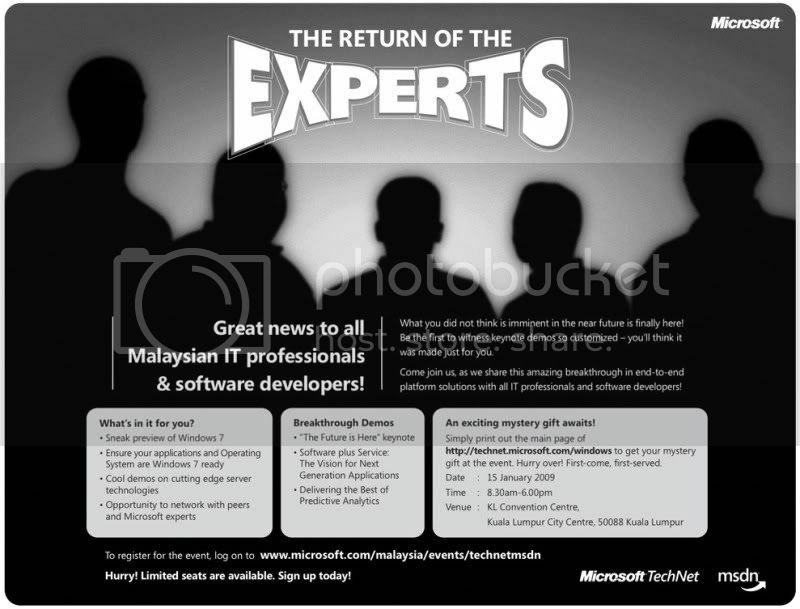 As a treasured member of Microsoft’s technical communities, you are invited to join us in this first ever held round of major gathering, Community Technology Update in Kuching, Malaysia. The event is about sharing and bringing together like minded folks like you together and helping to drive community awareness and event. The brainchild and initiative of 4 Musketeers (Chan Ming Man, Patrick Yong; Jabez Gan and Walter Wong) and run by the Kuching community and for the community, this half day ‘devInTown‘ affair will uncover the cool and latest technologies surrounding , Windows Presentation Foundation, LINQ and Windows 7 – delivered by our very own Microsoft MVPs. Each session will last for 45mins and will include a community sharing session whereby we will bring you up close and personal with the MVPs and hear them share their community experiences. We will wrap things up with an interactive Q&A session to answer all your burning technical queries. For more information regarding this event, please take a look at this link.